elec calc™ enables the edition of the calculation report of the installation. They allow to produce the needed documents for regulatory controls as well as the different documents of production for the installation. 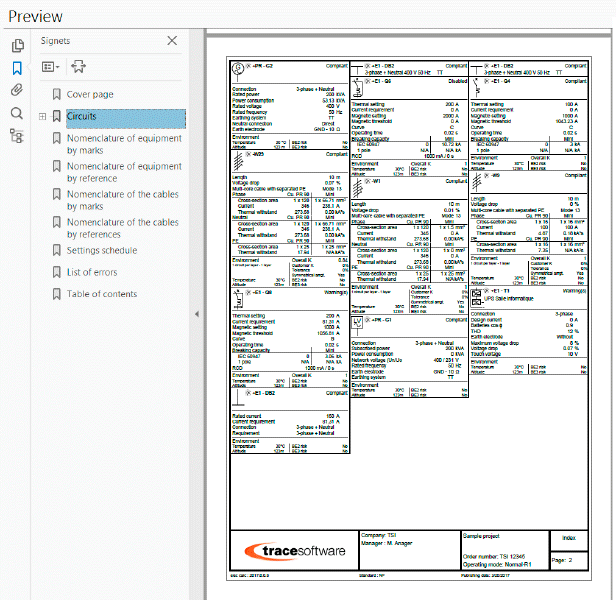 The generated calculation reports build up a complete folder both for the controller and for the responsible of the installation who have the drawings, calculation notes, cables notebooks and parts lists of the equipment. A logo can be inserted to customize the report and the edition can be sorted by location. The edition of the electrical calculation report with elec calc™ is immediate (previewing on the screen before paper or PDF printing). The language of the report can be different from the interface language.